Employee Review Form is a yardstick wherein the performance level of an employee is gauged to assess output and other associated factors. 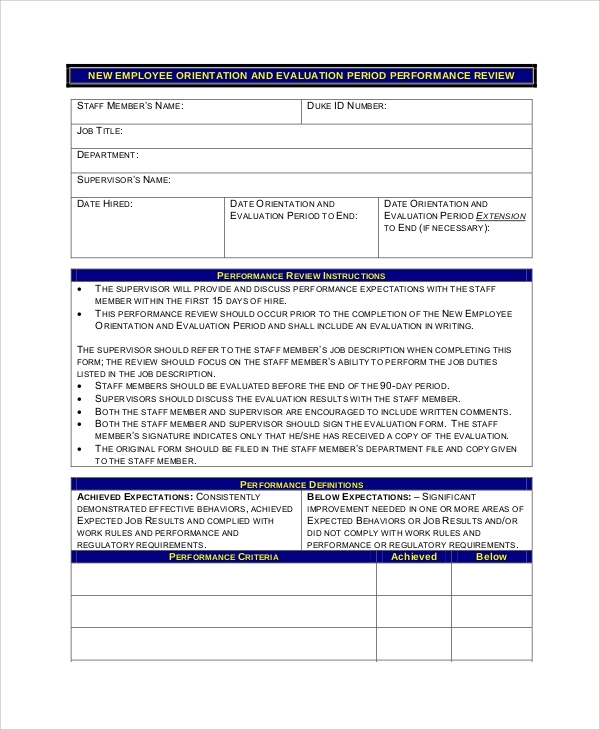 Sample Forms in this regard contain all the applicable information concerning the individuals who are subject to a performance review. There are various formats listed below, and each has their pros and cons. Formats do vary from one company to another, and the following, however, covers all the important aspects. This is a standard Employee Performance Reviews covering aspects like performance, technical skills, enthusiasm, attitude, initiative, creativity, attendance, work relations as well as a columns examining opportunities for development. 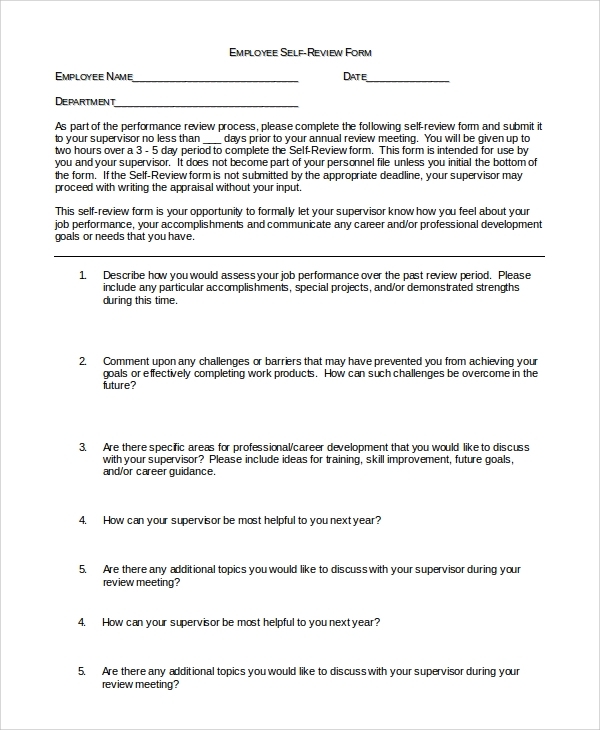 This Employee Review Form is done annually covering the standard features associated with a performance review. Comparison to the previous year’s assessment is a major factor as part of the whole process. Detailed records of all employees is a policy followed by almost all organizations. Regular updates and review of the records are undertaken to ensure all data on record is relevant and valid. Employee Review Forms assists the human resources department in an organization to gauge, review and evaluate every staff member’s performance professionally, systematically and without prejudice. It covers every aspect of skills, capabilities, work ethics to attitude and finally to output. The benefits of this process are a well-known fact, and it benefits both the employer and employees as well. The former is in a position to assess non-performing individuals and replace them; simultaneously it helps the employees too as they are reassured that if they perform, a system is in place to acknowledge the fact and reward them accordingly. 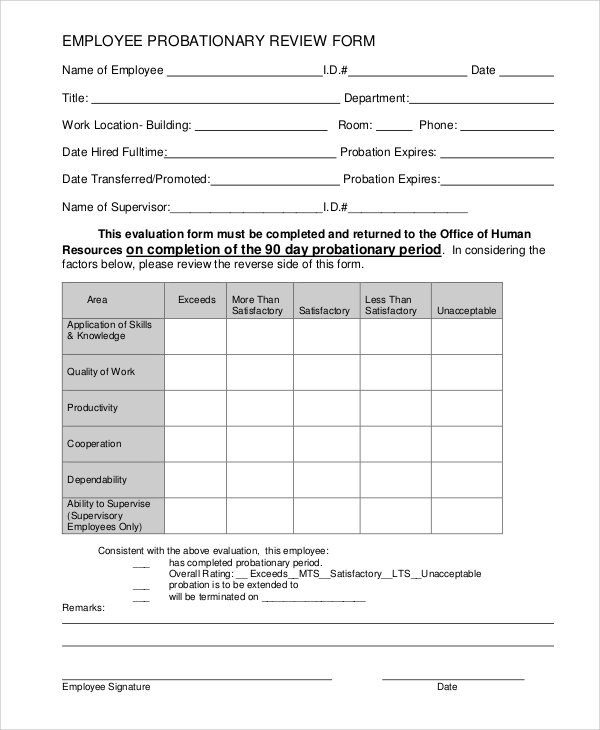 This form is used for self-review by employees. It is a concept being implemented by many organizations; it gives the opportunity for an individual to assess himself/herself, state what issues he/she faces and what assistance he/she seeks to improve his/her performance further. 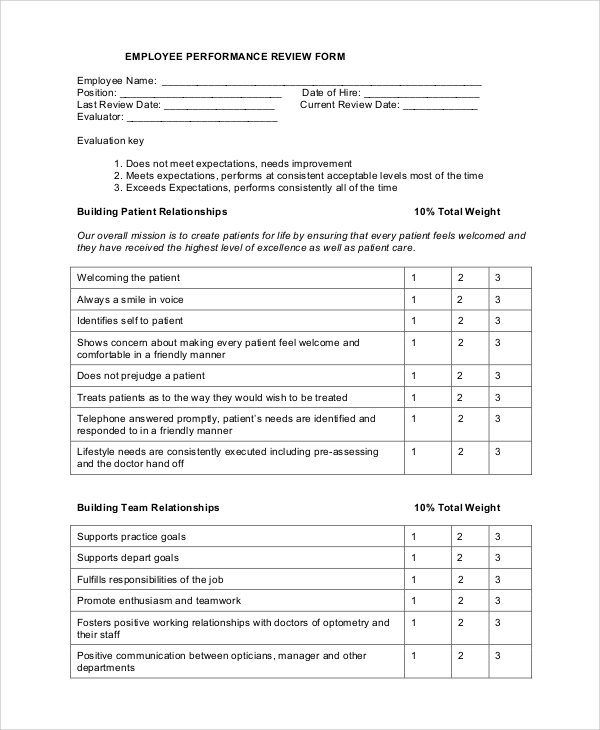 This format is used for a new employee orientation and performance review. This process is undertaken within a specified time after the individual joins. It assesses whether the concerned member has met the desired levels of output or not. How do these Sample Performance Reviews help employee performance? When an employee is aware of a system which gauges their performance, it kept them alert and focussed on performing to the best of their ability. They also get the impression that the process is unbiased and thus, acts as a motivating factor. Who can Utilise these Review Forms? 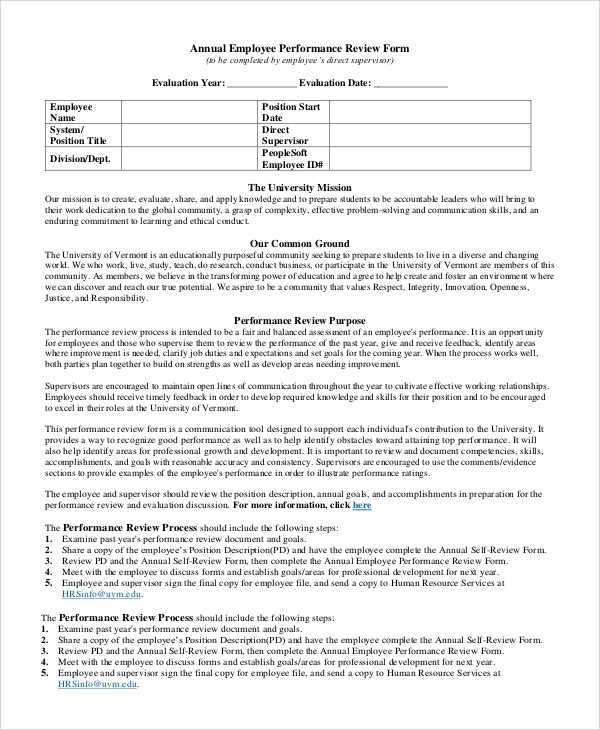 In addition to the human resources department, every other division supervisor or manager can utilize these review forms to not only assess the employees directly under them but also set benchmarks of what is expected of them to receive good reviews, which play a significant role in promotions and increments. 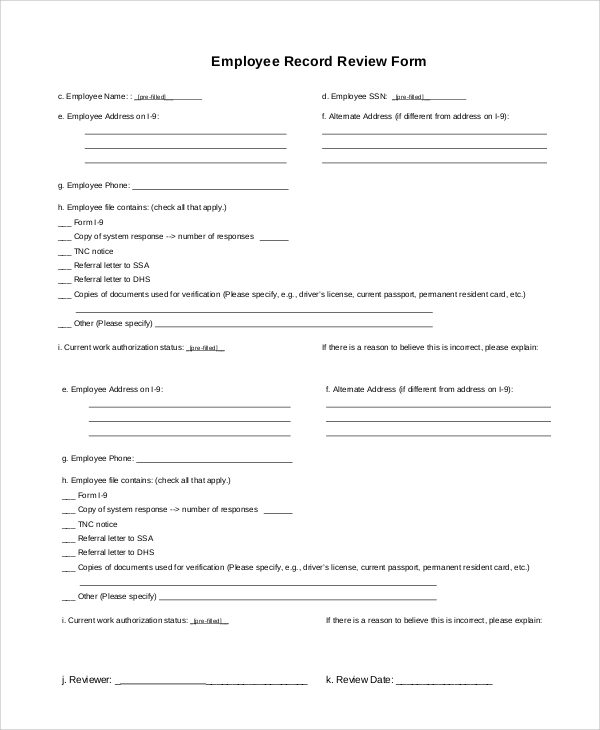 Employee Review Form is an excellent tool for all employers and their representatives to assess and extract the maximum potential of an employee. It also acts as a deterrent for such individuals who don’t take their jobs seriously and further acts as an identifying process of such employees. Performance Review Examples is an integral part of the whole process.